Tourism is no longer just touring and travelling and it is becoming more and more focused on the specialization in accordance with the customer choice, requirement, travelling moods, cultural emphasis, economic factors, health condition and specific social and socio-psychological trends. The specification drive and wide range of diversification across various segments of tourism played a crucial role in the recent boom and popularity of various types of tourism. As the health care situation all over the world is continuously facing a wide range of medical challenges in respect of treating a lot of life style oriented diseases and disorders that are chronic and almost tend to reach an epidemic proportion, medical tourism is gaining in popularity. Medical Tourism (MT) also termed as medical travel, health tourism or global healthcare more broadly health and wellness tourism, refers to the industry in which people from across the globe travel to other countries to get medical, and surgical care, due to various reasons, such as better convenience, lower cost, reduced waiting time to undergo a surgery/ treatment, which are unavailable in their own countries. Along with the treatment, they can also enjoy the charm of the countries they are visiting. Medical tourism is not just treating the patients who travel for medical care; it is all about making the patient feel at home away from home. A medical tourism provider may be an organisation or a company specialized in certain areas of healthcare. They seek to bring together a prospective patient with a service provider, usually a hospital or a clinic. It is the medical tourism provider who is responsible to offer complete information about medical facilities, quality, safety and legal issues. This includes information about the hospitals, clinic, doctors / medical professionals, travel agencies, resorts, medical/ travel insurance overseas as well as information's of local areas. The process of medical tourism begins with a person seeking medical treatment abroad, contacting a medical tourism provider. The patient must provide their medical report, including the nature of ailment, local doctor's opinion, medical history, diagnosis and other additional information. Then medical treatment is advised by certified medical doctors or consultants and the approximate expenditure for the treatment, choice of hospitals and tourist destinations and duration of stay, etc. are discussed. After signing consent bonds and agreements, the patient is given recommendation letters for a medical visa, to be procured from the concerned embassy. The patient travels to the destination country, where the medical tourism provider assigns a case executive, who takes care of the patient's accommodation, treatment and any other form of care. Once the treatment is done, the patient can remain in the tourist destination or return home. Medical tourism which is a blend of leisure together with wellness and healthcare mainly focuses on two kinds of treatment systems, i.e Allopathic and Ayurvedic treatment system. Over 60 countries have identified medical tourism as a national industry and some of the most popular among them are Greece, South Africa, Jordan, India, Malaysia, Philippines and Singapore. 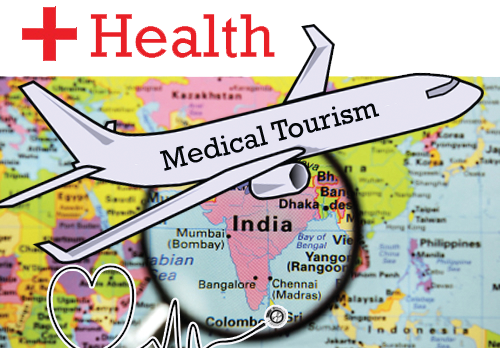 Why should you opt for India for Medical Tourism? Over the years, India has grown to become a top-notch destination for medical value travel because it scores high over a range of factors that determine the overall quality of care. Imagine a complex surgical procedure being done in a world class global hospital by acclaimed medical specialists at a fifth to tenth of what it normally takes! That’s India. From quality of therapy, range of procedural and treatment options, infrastructure and skilled manpower to perform any medical procedure with zero waiting time, the list of benefits of travelling for medical treatment in India are many. India is considered a highly effective centre for specialized treatments such as open-heart surgery, hip and knee replacement, paediatric cardiac surgery, dentistry, bone marrow transplant, cosmetic surgery, and therapy of cancer, among others. International patients come to India for treatment because of the world-class facilities available here at affordable costs. Moreover, there are no waiting lists or queues to baffle patients or their families. You get immediate attention and assistance in hospitals anywhere in India. Indian doctors and surgeons are well known throughout the world for their skills and medical expertise. This country offers you the services of some of the world's highest-qualified medical professionals along with top-class biomedical and nursing facilities. Here, patients can avail healthcare benefits in facilities varying in size from small, specialized clinics to large, multi-specialty hospitals. India's offerings are classified into a range of categories that can suit every budget and every need. Indian hospitals are equipped with highly advanced equipment and use latest technologies to offer sophisticated medical services that are easily comparable to those offered by developed countries. There are today courses in medical tourism that combine knowledge of Travel and Tourism with training in healthcare management. The MBA in Medical Tourism and PG diploma in medical tourism are mainly for those working in the healthcare and tourism industry with the intention to increase their knowledge and skill set, enabling businesses to operate on a more sophisticated level. All Graduates (medical/ non-medical) / 10+2 or its equivalent qualified candidates with good communication skills can opt for Medical Tourism courses. These courses of one to two years, intended to train a candidate in the medical tourism field, provide sufficient knowledge about the travel and tourism industry, logistics and hospitality industry, legal/ ethical issues, medical facilities and conditions etc. Other courses such as MBA Health Management, MBA Travel and Tourism Management, M.Sc. Health Care and Hospital Administration can also provide the training to work in this field. *Good knowledge of the topography of various places and hospitals offering medical tourism, so they can give proper guidance to the foreign tourists and patients from abroad in choosing the best hospital. *They should be aware of even minute details of health care and travel industry, laws and regulations governing medical tourism industries, hospital ratings, accreditation Visa and other related requirements. A host of employment opportunities await these professionals of medical tourism ranging from customer relations, medical support services, sales and business development, international business development and even finance and administration. As per estimates, around 1.7 lakh foreigners fly to India for medical treatment every year, to avail world class personalised healthcare services. Indian hospitals meet international standards of cleanliness and hygiene and their top-class infrastructure suits the needs of patients coming for treatments such as heart surgery, knee replacement, orthopaedic treatments, cosmetic surgery, eye care, dental treatment or any other healthcare need. Moreover, there is great attraction for the Indian systems of medicines, i.e. Ayurveda, Yoga, Rejuvenation Therapy, etc. which are among the most ancient systems of medical treatment, of the world. There are many hotels/resorts which feature an Ayurveda Center as an integral part and a large number of the foreign tourists come to India specifically for the Ayurveda treatment. Yoga/Ayurveda/Wellness is also being promoted in the print, electronic, internet and outdoor medium under the Ministry of Tourism's "Incredible India Campaign'', ? Brochures & CDs on Body, Mind and Soul covering the traditional system of medicine have been produced and circulated extensively by the Ministry of Tourism, and other agencies.